It took some time to gain enough confidence to begin actually playing the game competitively. Once I started, though, there was no going back. Right before the summer after my senior year of high school, I was getting bored. I was bored of school, bored of the sports I played, and bored of my job and bored of the usual things that took up the bulk of my time. One day, in early May, I was watching videos on YouTube when a video by the channel maxmoefoePokemon appeared in my recommended feed. I watched the entire 10-minute video of a hyper Australian man in his mid-twenties get overly excited about opening Pokemon cards. I recalled the collection I had as a kid and wished I had learned to play the card game properly, and more importantly, wished I didn’t trash or donate all the cards. I talked to my boyfriend a few days later and I asked if he had ever played the card game. He said he did. We sat on his bedroom floor for hours and went through the bulk of his collection. I was amazed. There was a whole new world opening its doors for me to discover. A week later, I found myself on a Target run. I wandered to the toy section for a brief moment, just to get one little thing. A pack of Pokemon cards. I bought a pack of the most recent set at the time - Sun and Moon Base Set. I opened the pack as soon as I got to my car. To my luck, within the 10 cards in the pack, I found a Full Art Espeon-GX. 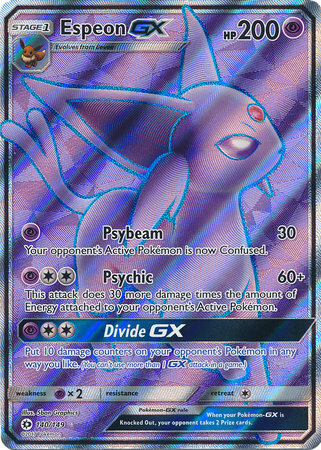 GX cards are special Pokemon cards that typically have higher HP (health) and 2 attacks. 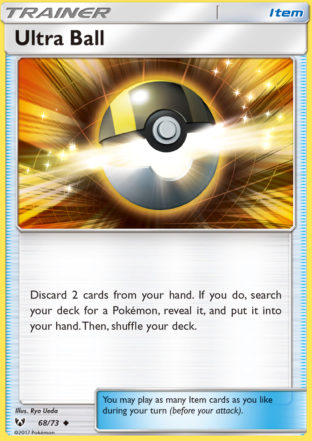 Each GX Pokemon also has a GX attack, which can only be used once per game. They could also have an ability, which allows more interaction between players to interact with each other. From that moment, I was hooked. I sent a picture of the card to my boyfriend and asked if it looked like it was any good. He said it was. He was interested in getting back into the card game and asked if I would want to build a deck around my Espeon GX. I excitedly agreed. 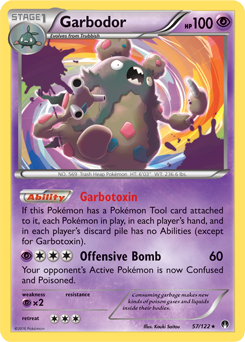 My first ever deck revolved around two Psychic-type Pokemon - Espeon, an evolution of everyone’s favorite Eevee, and Garbodor, a literal pile of trash. Together, they worked to shut off the abilities of other Pokemon cards and hit for big damage. It took some time to gain enough confidence to begin actually playing the game competitively. Once I started, though, there was no going back. Of course at first, I often lost to more experienced players. I took every loss as a lesson and analyzed what I did wrong and how I could fix it the next time. It was also important for me to look at every win in a critical light. How could I have won easier? How could I have played differently? Did I simply get lucky? As I improved my skills, I was better able to understand the different decks I was playing, as well as the decks my opponents were using. In doing so, I could better make a decision based on my opponent’s deck and their actions. I found myself having the most fun I’ve had playing competitive games in years. Plus, I got to spend more time with my boyfriend, which is always time well spent. Some of my favorite memories of my boyfriend include late night deck building the night before a tournament. Making changes to the deck you play is crucial. One card really can make a difference in winning or losing the game. Tool cards like Choice Band add extra damage. Fighting Fury Belt boosts HP. Field Blower gets rid of tool cards like the two previously mentioned. Increasing or decreasing the count of cards like those can really impact the way a deck functions. Pokemon hasn’t just been an event my boyfriend and I do together. We have met some really awesome friends along the way. Once on a Saturday morning in the middle of Lancaster, Pennsylvania, we met three people we continue to talk to and go to tournaments with today. Both me and my boyfriend and the friends we made that day traveled over an hour to get to the tournament, so the fact that we all went on that day and happened to start talking is seemingly a miracle. We began going to the weekly tournaments that our new friends went to and met even more people there. Our group chats are always lively and our texts consist of new ideas, rumors of new cards, friendly conversation, and of course banter. Now, I’ve been playing Pokemon the Trading Card Game competitively for almost a year. I’ve been to tournaments in Pennsylvania, New Jersey, and Delaware. Just a few months ago, I placed 5th at a huge tournament in New Jersey. With that placement, I gained bragging rights and a free VIP ticket to a much larger tournament that will take place in August. Through going to Pokemon tournaments, my boyfriend and I have made friends with people we would never have met otherwise. This summer, we will be traveling to both Virginia and Ohio for tournaments, where we will be given the opportunity to bond with the friends we have already made, and meet plenty of new people! I am so very grateful for the opportunities I have had to be introduced to Pokemon the Trading Card Game. I am beyond thankful for the people that I have met and how welcoming the community can be. Pokemon has been more than just a hobby for just me and my boyfriend. It has become an important part of our lives, and I wouldn’t change it for the world.